1. Before use, please carefully refer to the instructions, pay attention to the recommended rechargeable battery charging current, do not exceed the recommended current charge. 2. Charge with a 5V USB adapter (adapter current recommended 2A). 3. When you stop using it, unplug the power and unplug the battery. 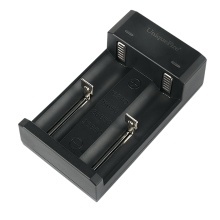 *Support a variety of battery models for charging, compatible battery model: 18650, 14500, 16340, 26650, 36650, 10400, etc. Convenient and fast. *The charger can charge 2 different types of batteries at the same time, each battery slot can be charged independently. *The indicator light shows the charging status: During charging status, LED light is red. When full charged, the LED light turns green. *Come with USB charging cable. Standard USB interface can be charged by charger, power bank, PC or mobile devices, etc. *Six protections: overcharge protection, over current protection, over temperature protection, short circuit protection, reverse connection protection, over discharge protection. Compatible Battery Model: 18650, 14500, 16340, 26650, 36650, 10400, etc.